CAB PAO, 4th Inf. Div. CAMP TAJI, Iraq – As the sun begins to set beyond the Baghdad horizon, the sound of laughter and conversation emanate from the corrugated steel sleeping trailers of Company C, 3rd Battalion, 4th Aviation Regiment, Combat Aviation Brigade, 4th Infantry Division, Multi-National Division – Baghdad. Behind the chatter, an alarm clock sounds, alerting Sgt. David Brocato it is time to get ready for the night’s mission. It’s 6:30 p.m.
Like any Ironhorse Soldier, the young 28 year-old crew chief knows that proper preparation is a must before any operation as he begins mentally preparing himself for the long night ahead of him. Sgt. David Brocato, crew chief, Company C, 3rd Battalion, 4th Aviation Regiment, Combat Avn. 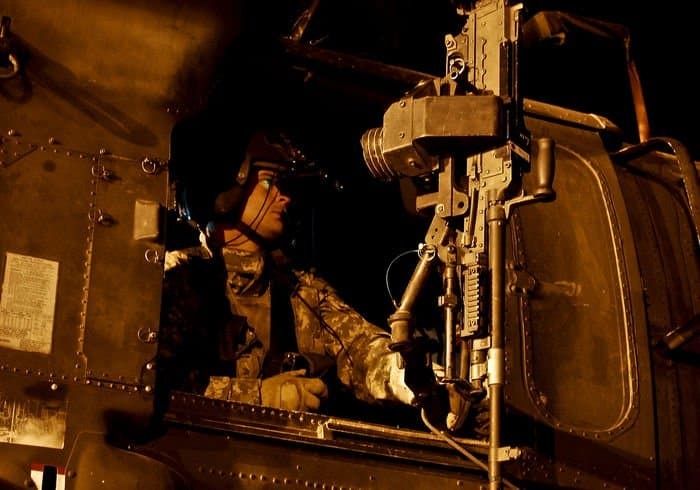 Brigade, 4th Infantry Division, MultiNational Division – Baghdad, mans the gunner’s seat of a Blackhawk helicopter before the start of a mission on Camp Taji July 20. With more than 1,000 flight hours under his belt, Brocato’s responsibilities range from in-flight instructor to performing critical fixes on the aircraft during missions. He is also considered the eyes of the aircraft, and is required to help the pilots maneuver the helicopter in and out of tight areas as well as watch for threats from the sky. Brocato hails from Kentwood, La. “The reason I came into the military and into this job goes back to when I initially joined the Army,” the Kentwood, La., native explained embarking on his routine quarter-mile journey to his company’s flight line. As a UH-60 Blackhawk helicopter crew chief, Brocato’s responsibilities seem almost endless, especially working for 3rd Bn., 4th Avn. Regt., whose mission for MND-B is three-fold. The battalion is responsible for air assault missions, formal aviation mission requests as well as routine personnel air transport called the Iron Horse Express all throughout the MND-B area of operations. Sgt. David Brocato, crew chief, Company C, 3rd Battalion, 4th Aviation Regiment, Combat Avn. 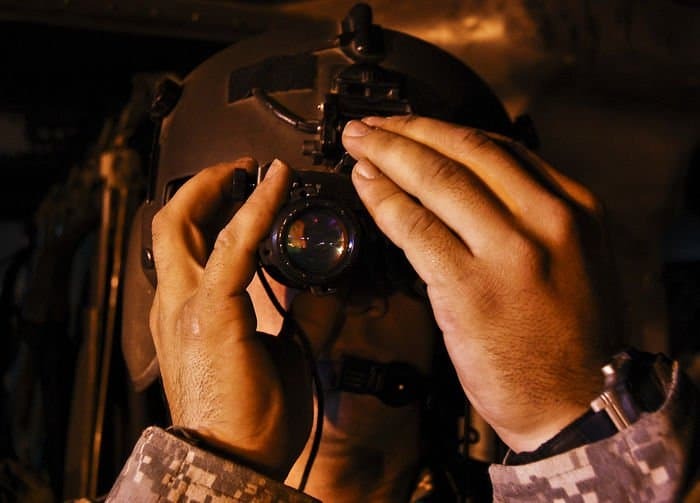 Brigade, 4th Infantry Division, MultiNational Division – Baghdad, focuses his night vision goggles before the start of a late-night mission at Camp Taji July 20. Brocato is a native of Kentwood, La. With more than 1,000 flight hours under his belt, the senior crewman’s responsibilities range from in-flight instructor to performing critical fixes on the aircraft during missions. Also considered the “eyes of the aircraft,” he is required to help the pilots maneuver the helicopter in and out of tight areas as well as watch for threats from the sky. Most of their missions last about 6 hours. The time now is about 8 p.m., three hours before mission. With the expectation of an air assault operation tentatively scheduled for 11 p.m., Brocato’s tone becomes more serious as he looks over the night’s flight schedule. He checks and rechecks both mission number and helicopter number before quickly moving to another office containing maintenance logs. He uses the logs to ensure his aircraft is mechanically sound. This process lasts more than an hour. “Any kind of maintenance, or mechanical issues are all logged into a computer system and it’s my responsibility to ensure all the scheduled maintenance has been completed before we even go out to look at its condition,” he said. “Aircraft maintenance is very meticulous because of the risk factor involved with flying. If a mechanical problem occurs in the air, it puts the whole crew at risk for injury and even death. Essentially it is the crew chief’s responsibility to ensure this doesn’t happen,” he continued. It is nearly 9:30 p.m. before Brocato and trainee Spc. Daniel Simonson begin their pre-flight inspections of the aircraft. 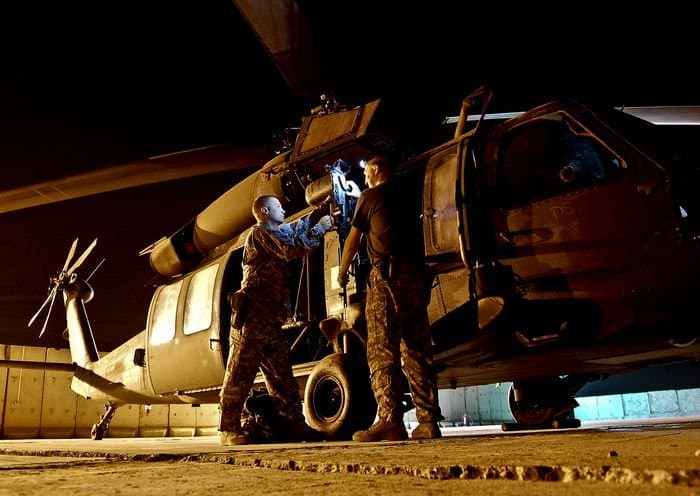 As they scan the exterior components of the Blackhawk, Brocato is met by another member of his team informing him the air assault mission has been cancelled. This cancellation hardly equates to anything for Brocato and Simonson. a Freeland, Pa., native, who briefly acknowledge the announcement, as they continue the inspection process. “When there isn’t a scheduled air assault that doesn’t mean that we get the night off,” Brocato said laughing. Sgt. David Brocato (left), crew chief, Company C, 3rd Battalion, 4th Aviation Regiment, Combat Avn. Brigade, 4th Infantry Division, MultiNational Division – Baghdad, and counterpart Spc. 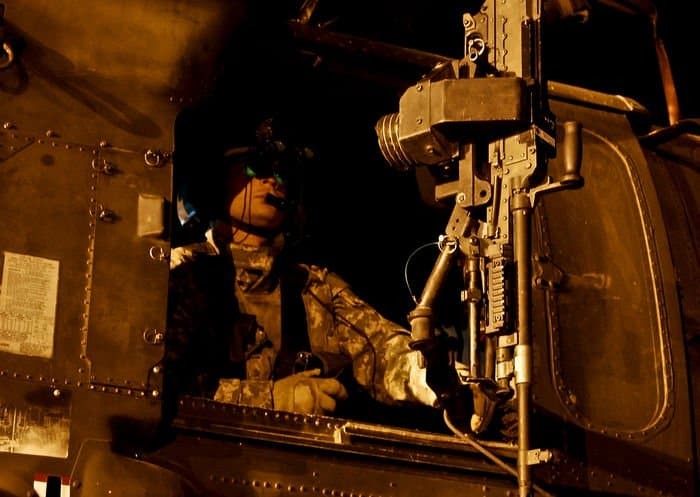 Daniel Simonson, mount a M240B Machine Gun to the gunner’s position of their Blackhawk helicopter before the start of a night mission on Camp Taji July 20. Crew chiefs’ responsibilities range from in-flight instructor to performing critical fixes on the aircraft during missions. Also considered the eyes of the aircraft, they are required to help pilots maneuver the helicopter in and out of tight areas as well as watch for threats from the sky. Most of their missions last about six hours. Brocato is a native of Kentwood, La. As an experienced aviator now on his second tour to Iraq, Brocato prides himself in the training of his Soldiers and any chance to show them how to proficiently perform their duties in the air, whether on mission or in training, is an honor. Long-time aviators of his unit consider it an honor to watch the young crew chief grow and meld into an inspiring leader and predict his career in the Army to be a long one. “I see Sgt. Brocato in ten years as a command sergeant major or a chief warrant officer-3 or chief warrant officer-4,” said 1st Sgt. Michael Davis, the company’s senior enlisted leader. Just like his grandfather before him who was one of Louisiana’s first helicopter pilots in the military, he knew exactly what he wanted to do when he signed on the dotted line. For the young crew chief, aviation was the only way to go. With only about 45 minutes until the crew’s scheduled take-off time, Brocato goes over a few more things with Simonson, and ensures the trainee is prepared for the mission; a duty the senior crew chief doesn’t take lightly. “He’s been here before, knows the ropes and he’s passing it on to the new guys,” said Sgt. 1st Class Jeff Shott, an Effingham, Ill. native, and platoon sergeant, speaking of Brocato. As the engine starts, and the Blackhawk’s rotors turn, Brocato assumes his place of duty. Unlike the common infantryman, whose place of duty requires them to patrol the streets of Iraq, a crew chief’s place of duty is the air.